Yesterday I took Dressy (and Diego as well) to Summer’s End Training Ride over in Bailieboro, Ontario, which is just on the edge of the Ganaraska Forest. It’s a very pretty area, with lots of hills. In the morning we had the clinic portion. First Marg Murray and Marion Shearer gave an overview presentation of the different disciplines that OCTRA offers… Endurance, Competitive Trail, Ride n Tie, Set Speed, and Mileage rides. Each has slightly different rules, but the training is essentially the same for the horses. It’s the equivalent of human marathon training. After Marg and Marion were finished, Dr Kathy Kivi talked about electrolytes and horse health. Rose Danko gave an explanation of Set Speed rules. It’s a new discipline in OCTRA, and not well understood by most members. But basically it’s between 10 and 50 miles. A speed range is set, depending on competition level. Yesterday’s ride was between 4 and 7 mph. In a graded ride, the competitors are awarded grades depending on the combined score of pulse and speed. A low pulse and a high speed will give you the best grade. Grades are, from highest to lowest, 1, 2, 3, 4, or completion. After Rose was done, I gave a quick demonstration of how to present your horse to the judges and what the horse health check is all about. I’m a lay judge when I’m not competing myself. Which means that I perform vet checks at competitions (under the supervision of the head veterinarian). Finally, Julie Green gave a presentation on hoof care and booting. She’s an EasyCare distributor and her husband is a barefoot trimmer. There seemed to be lots of interest in the topic. The weather was horribly hot. The temperature was 27 C, but humidity was 95%. It was just awful. Heat has always been a problem for Dressy, so that was not a good sign. Dressy and I sponsored Solstice in the Ride n Tie. Her little mare was quite excited, so I ponied them out the first little bit of the loop until we got into the forest and she could tuck her in behind Dressy to keep her slowed down. She’s a cute little horse, but was a little bit boggled by all the excitement. The little mare was not the only horse boggled… Diego threw a hissy fit when his boss mare left. I could hear Misha yelling at him as we disappeared into the trees. I heard later that his initial vet check was very out of control. Though I think he improved through the day. Solstice and her dad won the ride n tie. The other team, Michelle and her daughter Cassandra, were right behind us. Dressy and I won a $10 Tim Horton’s gift certificate for sponsoring the winners, which was nice. There were three 5 mile loops, with the option (since it was a training ride) to stop after any loop and take that mileage. Dressy did well on the first loop. Good heart rates. At the first check, she drank well and was absolutely starving. She vetted through fine. I tacked her back up (with some help from Julie – who was a big help to everyone at the checks) and led her over to let her drink and suddenly she started acting like she wanted to drop and roll. Immediately I had a total panic attack, thinking she must be colicky. Ripped the tack back off her and took her back over to the vet (jumping the line in the process). The vet checked her over, but couldn’t find anything wrong. She wasn’t trying to roll, and had gut sounds all around. The vet thought that maybe she’d had a bit of a gas bubble or something. So we tacked back up and went out again for our second 5 mile loop. For the first couple of miles she seemed fine. Then I thought she seemed a little less forward. I checked her heart rate and found that it wasn’t registering on the watch. The monitor had shifted a bit under the girth and wasn’t reading. I reached down and tinkered with it and started getting some intermittent readings. None of them very good. Mostly up in the 140 to 160 range. They may or may not have been valid readings, but I was a bit worried. So I told Laura we needed to walk for a while. Eventually I got more reliable readings and she seemed to have dropped down to a more reasonable level. By the time we hit the end of that five miles, I thought that she might have stopped sweating, which really worried me. She felt extremely hot to the touch. So I figured we were probably done for the day. At the check, she had a nice low pulse… 36. The judge noted that she was skipping heart beats, which is something she normally does, so of no concern. But she skipped for a bit longer than usual and several times during the 15 second count (she was trying to nap at the time). And when she trotted out for her CRI (cardiac recovery index), she woke up again. Second count was 14. Which is very very bad. The judge pointed out that it was just because she did not skip any beats on the second count, but Dressy has had enough 9/9 CRIs that I know there is no excuse for a 9/14. Her trot out was a bit wonky for a couple of steps, but the vet watched it on a second trot and decided that it was just a bit of toe-dragging and not a lameness. She got a completion. But probably only because I was not going on for another loop. She was very hungry at that check too, and gobbled up every bit of food she could find. Drank well all day. Had lots of electrolytes. I really think she was suffering from heat exhaustion. She has never done well when it was hot. And I think that the heat and humidity wiped her out. She was completely herself again within about half an hour. The vet checked her over once more and found nothing wrong. She had gut sounds all the way around all day. Came off the trailer at home looking good. Looks good today. And, despite all the worry… she ended up taking a grade 1 in the 10 mile set speed ride. Her final pulse was 36 and average speed was 6mph. So by the numbers, she did really well. I sent Laura back out for the third loop with Marg, and they did finish the 15 miles. Which gave Holly her long-awaited 1000 miles. 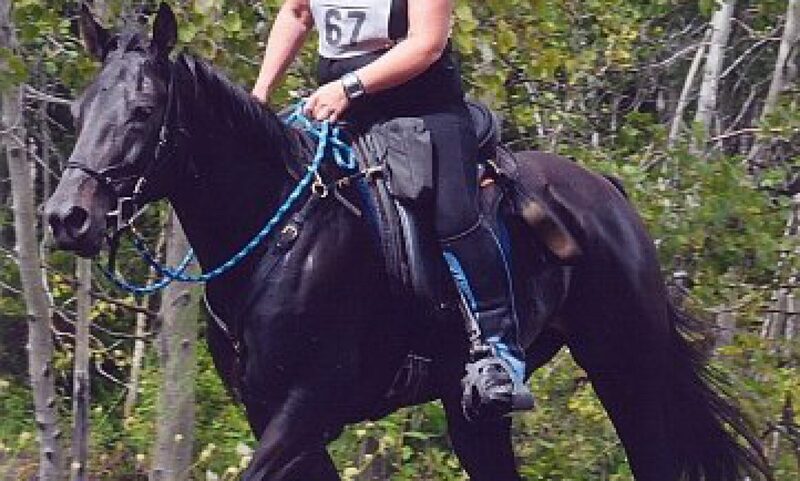 Holly has been out of competition for a few years due to a very bad injury that Sue suffered. It was bad enough that she was told never to ride again, and so gave up riding Holly, who can be a bit of a handful (especially if there are cows in the vicinity!). Sue now rides the lovely and very quiet Foxy, who is one of my rehomed Standardbreds. This year, Holly has been ridden by a junior rider and has been creeping up on the 1000 mile mark. She sure was cheerful out on trail. You can tell that Holly just loves going down the trail. She looked like a five year old bouncing along out there. Diego had an excellent day. He has no problems with heat. In fact he’s one of those crazy Arabs who gets cold if you put too much water on him. He did the 15 miles fast enough that he had to wait a while before the finish line so he didn’t get disqualified for finishing too fast. His final pulse was 40 and average speed was just under 7mph. So he got a grade 1 as well (in the 15 mile Set Speed). King felt really good today. We did a short six mile ride around the home trails, and he was strong and forward the whole time. Much more like his old self. And I have to say, sometimes I really REALLY appreciate my horse. While King can be quite an obnoxious demon when it strikes his fancy, he is unusually reliable in a crisis. Today, I made a major navigation error. Going into an overgrown forest trail from an open field, I had my sunglasses on, and didn’t see that I was going into the wrong spot. There was an old page wire fence falling down, and we walked straight into it. King fell right down on his face, and had both front legs caught up in it. He jumped up, with me yelling “WHOA! Stand!”. And bless his soul…. he stood. I kept repeating myself, and he cocked his head sideways and looked down at the fence while carefully extracting one foot at a time. Then he took one step back from the wire and stood waiting for me to tell him what to do next. We backed up and carefully turned back to the field. I had a quick look and saw a number of very small cuts, but nothing that looked too dangerous. His sweat must have made them all sting though, because he kept stopping all the way home to rub at them with his nose. And he sure enjoyed his bath when we got back. I think it must have felt good to get the salt washed out of the cuts. He looks fine. None of the cuts are punctures. Just shallow cuts that had pretty much stopped bleeding withing a couple of minutes. And I don’t see any swelling coming up so far. I took King out today for a long slow ride. I was feeling pretty down actually. There’s been another death in my family. This one was an accident… lightning strike. So the news was quite a shock. It felt sort of weird to go out riding. But at least it was a good way to be alone with my thoughts for a while. We went down to the Jefferson Forest and poked around those trails for a while. And on the way back I did a little exploring to find some trail that kept us off the roadside for about a quarter mile. I really hate riding along the road. It’s so close to Toronto, and the drivers are all so clueless about horses. Sometimes big truck mirrors go whipping past about a foot from my shoulder. All it would take is for a bird to flap up in front of him, or a bit of garbage to spook him, and I could have a very close encounter with either the mirror or the whole damn truck. So the less I’m on roads the better I like it. We did a little over 12 miles. He didn’t have any cramps, though we did go slow. But I’m cautiously hopeful that he’s improving.